[So says Hermione anyway]. 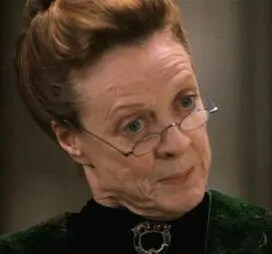 At Hogwarts School, Transfiguration is taught by Professor Minerva McGonagall who also transfigures herself into Violet Crawley on Downton Abbey. So transfiguration has make its way into popular culture. But let’s rewind a bit [a few thousand years] to a couple of old stories that present us with the theme of transfiguration. The Transfiguration story of the NT Gospels is a parallel story to the Jewish story of Moses starting in Exodus 24. In both stories, there is a pivotal moment, set on a mountain. In both stories human nature meets up with the Divine. And in both stories, the main characters [Moses and Jesus] are changed by that experience. And the others who know them are confused, scared, and even skeptical about the change they now see. The mistake that many make with these two stories is to assume that both Moses and Jesus were godly prophets/leaders chosen by God, and so transfiguration is limited to such rare people who come about once in a lifetime. It’s been said far too often that transfiguration changed both Moses and Jesus into God, and therefore, obviously such an experience is not accessible to everyday people like you and me. But let’s beg to differ. Let’s try our best to not reach like the skeptical, scared, close-minded disciples of Jesus and the followers of Moses. What if transfiguration is not some pie-in-the-sky concept, but a tangible experience for every person? What if you can be transfigured too? What if you are right now? See, the concept of the Transfiguration was a preview and an anticipation of the Resurrection. In Moses’ case, he was transfigured and then was able to act as connector between the Israelites and Yahweh. Their covenant was resurrected, and they began their journey together towards Jerusalem. In Jesus’ case, the transfiguration woke up the disciples to a new reality—that God was not stuck on some mountain or in the heavens. And that people who felt like they were dead could actually rise again to life. Transfigure : A complete change of form or appearance into a more beautiful or spiritual state. Where are you seeing changes of form and appearance into more beautiful and spiritual states? As for me, in conversations I’ve had with friends and colleagues who identify as LGBT, some of them say that their “coming out” to family and friends was akin to a transfiguration experience. Disclosure of one’s own sexual orientation and/or true gender identity to loved ones is a big revelation. Of course, it can be really difficult too, depending on their family member’s and friends’ reaction. But coming out doesn’t change the actual individual, as my friends say, but rather how others perceive and relate to them. I don’t think it’s a stretch to see threads of “coming out” in Jesus’ transfiguration story. I mean, he was surrounded by his close friends/followers, and when Jesus did transfigure those close friends struggled with the change. There was confusion and mistrust. They had lots of questions. But in the end, when they were able to accept and embrace Jesus’ transfiguration, they changed too. Others of you can transfigure/are transfiguring. You are waking up in your own way to the possibilities of changing your own form into a more beautiful and spiritual state. You are seeking justice for those without it; you are spending hours and energy working for the health and safety of others without expecting anything in return; you are embracing yourself as you are and learning to live with your mistakes; you are discovering that God is so much bigger than any religion, church, or book; you are befriending people who are different than you and finding shared values; you are transfiguring. Friends, what if we are on this planet to be agents of transfiguration? I wish for you moments and an ongoing lifestyle of transfiguring. May we transfigure situations of injustice in justice, love into hate, indifference into compassion. May we accept and embrace anyone who is transfiguring. How Do Changes Change YOU? Does this word scare you? Make you shiver? Excite you? Heighten your anxiety? Give you hope? Motivate you? Change. How does this word make you feel? It is not hyperbole to say that recently, in the United States, the word change for many does not have a positive connotation. A president addicted to the bully pulpit and one who consistently uses fear to distract and separate people does not help. Not all change is good, isn’t that true? Removing protections in public places for transgender people and for transgender students is not a good change. Requiring people to carry and show IDs randomly doesn’t feel like a good change either. Forcibly removing native peoples from Standing Rock, their own land, so an oil pipeline can be installed, is not a good change. Banning the majority of the press from presidential press conferences is a bad and dangerous change. Lawmakers skipping out on town hall meetings…not a good change. Detaining people in airports, like Muhammad Ali’s son, a U.S. citizen born here in Philly, asking him about his religion—a horrific change. Fanning the flames of ignorant prejudice and hate crimes, not a good change. Rest in peace, Srinivas Kuchibhotla, engineer and family man of 32 years, shamelessly killed in a bar in Kansas by a white man who said: “Go back to your country” before he shot Srinivas and wounded two others. So no, not all change is good. In my view, any change motivated by fear, prejudice, manipulation, or power is not a good change. Change is good when it is progress, when it leads to positive transformation. Changing positively is allowing for a new reality and then advancing towards that which makes us better people. They have trouble listening, though, and they fall to the ground, scared out of their minds. But Jesus reassures them with a simple touch [like in healing] and these words: “Get up and do not be afraid.” They look up. And then they come down from the mountain. Day seven; the change begins. This metaphorical story has relevance in this very moment, I think. It is not a stretch to say that our world is disfigured in so many ways. Why do we judge people by who they love, the color of their skin, their last name, their religion, where they were born or grew up, or which bathroom they choose? This is sickness, not health. This is disfigurement, not transformation. So those of us who actually do want to live in a world in which people are valued as they are, and diversity of all kinds is embraced, and affirmation and compassion rule the day—those of us wanting this reality, this change, we have to go up to the mountaintop. We have to take the time to search ourselves, recharge our batteries, heal and rest. We have to take the time to reinvent, recreate, and transform ourselves. And then we come down from the mountain. Then we make change happen. A big mistake I have made [and many of us] is to wish for positive change, talk about it, but then never do the necessary hard work to make it a reality. I’m done waiting for a change to come. I’m finished with wishing or hoping for all people to be treated well. I don’t want to wait for the seventh day to come so that light will break through. I want to be part of positive change now, in this moment. Today. And so I remind myself [and I remind you] that real change is cyclic. In order to make lasting change, all of us will have to do that tedious and difficult mountaintop work of introspection, self-examination, and transformation. We will need to ask hard questions of ourselves. We will need to look in the mirror. This allows us to have the strength necessary to face the obstacles when we come down from the mountain. This gives us the wisdom to discern who we should join with and who we should part ways with. The world is disfigured. We must face it and not ignore what is going on. But we must spend time and energy recreating and transforming as people, and then making positive changes happen. The approaching 40 days of Lent are an opportunity. How will you get to know yourself better? How will that work lead you to positive change within yourself? And then, how will that personal change lead you to make positive change happen in the world? See you on and off the mountain….